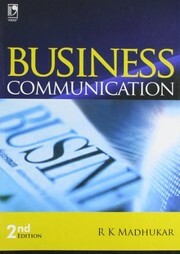 1 edition of Business Communication [Paperback] [Jan 01, 2010] R.K. Madhu... found in the catalog. Add another edition? Are you sure you want to remove Business Communication [Paperback] [Jan 01, 2010] R.K. Madhukar from your list? Published Jan 01, 2010 by Vikas Publishing House .